A bit more local, Harmony Vineyards allows dogs on their outdoor patio. Sip on a glass of their Chardonnay or enjoy their strong-bodied Cabernet Sauvignon while enjoying a view of both the vineyard and waterfront with your pup by your side. Fido can join you as you purchase apples, munch on cinnamon donuts, and sip hard cider at Woodside Orchards in Aquebogue. Guests can hang out with their leashed dogs around the fire pits or enjoy a variety of ciders in its small tasting room, which serves traditional, cinnamon, and raspberry ciders by the taste and by the pint. One of North Fork's original wineries, Palmer Vineyards is a dog-friendly space perfect for enjoying a glass of their world renowned wine. Leashed dogs are welcome on the outdoor patio, as well as the pub-style tasting room. The estate winery is home to a vineyard cat, so make sure Poochie plays well with felines. 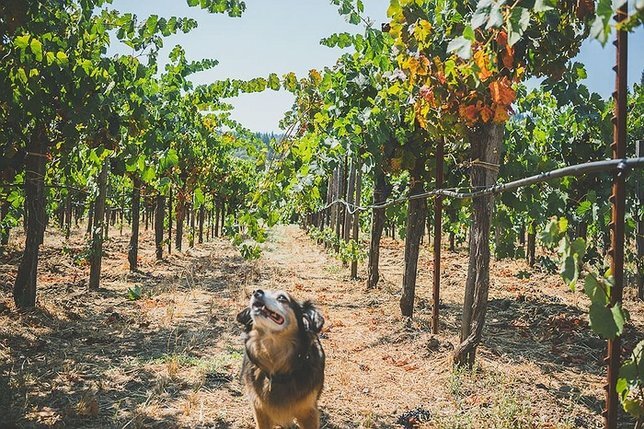 Stop by Shinn Estate Vineyards with your pup and enjoy a glass of wine in its rustic tasting room or on the outdoor patio. Leashed dogs and their owners can try a Traditional Tasting for $15 or a Production Reserve Tasting for $24. After your tasting, enjoy a bottle at one of the outdoor picnic tables and relax. Other activities, such as barrel tours, vineyard walks and winery tours are available as well. Head to Osprey's Dominion Vineyards and enjoy a glass of wine made with the least interference from humankind. Osprey's Dominion allows leashed pets on its four-acre grounds, which feature shaded picnic tables, Adirondack chairs, lawn games, and more. Dog owners are invited to pack their own picnic lunch. During the cooler months, dogs are allowed inside the tasting room. Leashed dogs are welcome to join you as you enjoy a glass of wine at Martha Clara Vineyards. Dogs are welcome only in the large outdoor area of the tasting room. Martha Clara offers individual tastings, flights, and wines by the glass and the bottle. Private and group tastings can be reserved by calling ahead. Your pooch will love visiting Macari Vineyards, decked out with both indoor and outdoor spaces. Indoors, pups can hang out as their owners enjoy their wine. Guests can also take flights, glasses and bottles outdoors to get the most out of vineyard views and warmer weather. A twenty-acre property in Jamesport, Jason's Vineyard is a dog-friendly spot to swirl, sniff, and sip a glass of wine alongside your fur baby. Sheep and alpaca wander the property, and there is typically live music on the patio. Dogs are not allowed inside the tasting room; however, they are allowed on the grounds outside. North Shore Animal League's Four Legged Friends: Meet Phillip, Madison & Huck! LI's Adorable Adoptables: Meet Ariel, Truffles and Rusty! Subject: LongIsland.com - Your Name sent you Article details of "Furry Friends Welcome: Check Out These Pet Friendly LI Vineyards"